Oh friends do I have a treat for you!! 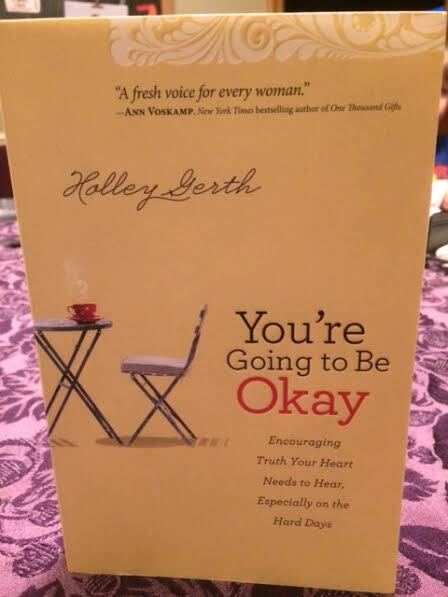 It is a special week because my dear friend, Holley Gerth’s, newest book is finally available to purchase! Holley is a natural encourager. She has a gift of using her words…God’s words, to touch the hearts of women. She is no stranger to difficulties either. She writes with the understanding of a close friend. She has walked through dark times, and seen God’s goodness during and after. Those are the words that you will find in this book. Words of encouragement, affirmation and support. Just starting the book she talks about God’s purpose for our lives. Do you know that I lived a long time believing that I had messed up God’s plan for me? Mistakes, problems, and difficulties in my family had me feeling like I couldn’t ever get “back on track”. And then I read this in Holley’s book…. All this time I had never considered that. You know the idea that the all powerful God of the Universe may just have a little more control than little ol’ me and I am unable to mess up His ultimate plan?! Seriously! 😉 But really – I believed God couldn’t redeem my mess! And finally before I share too many of the amazing nuggets that this book has, there was this…. But Holley reminded me that he uses my weakness to make me strong. So I press on, and share my mess-ups and then share about the continued redemptive work of God in my life because without Him NONE of this is possible!! I KNOW that this book is going to be a blessing to so many and I just can’t keep the joy all to myself! So I am giving away a few copies today! Yay and fun right?! For an additional entry tweet the link below and come back to let me know you’ve done it! This entry was posted in Book review, Giveaway on February 6, 2014 by Kristin. I’d love a copy of this book. I’ve so enjoyed Holley’s other books! Holley’s words are such an encouragement to me. I read them to my husband also. Would love a copy of her newest! This book sounds like something I could really use right now! I have been married for a little over a year and my husband and I have decided to rededicate our lives to going to church and learning what God’s purpose is for us. We often struggle to stay focused and not let “life” get in the way. I have only recently discovered your blog, but I truly think it was for a reason and the timing certainly does not seem to be just a coincidence. This book sounds like it would only further help us on this journey. Thank you for your honesty in your blog!! I would live to win a copy to use as a giveaway at one of our MOPS meetings. Lots of overwhelmed mommies (many unbelievers) there who could use some godly encouragement! I have always loved Holley and the way in which she writes those truthful reminders of who we are in Him! And since this book got released “in advance” to some people, my IG feed was filled with quotes from her and it just had me wanting to get a copy. I’m still finishing my God-Sized Dreams book because I’m reading it slowly as well … trying to soak up every word of truth and remind myself of what He desires for me. I would love to read this book, too!! I would then like to pass it on to a friend who is going through some unimaginable things right now. I believe that this would be a great read (and reminder) for her that she IS going to be okay! I love Holley and all of her books are so encouraging. What a wonderful title – sometimes we just need to hear that we are going to be okay. I would love to read this book and then pass it on to a friend that I know could benefit from hearing this right now. I feel like I could have nearly highlighted the whole book! I have so many people I’d love to share it with. I tweeted about the giveaway. Would LOVE to read Holley’s latest book! Thanks for the opportunity to win a copy! I love Holley’s writing style. She is such a blessing. I struggle sometimes with feeling as if I am most definitely NOT going to be okay so once I finish You’re Already Amazing and You’re Made for a God-Sized Dream, I’d love to read this and add it to my growing collection of Holley’s books! Thank you! Our family has been through so much the last few years and I have been so blessed by Holley and other writers/bloggers that have encouraged me as a wife, mom and woman of God through these times. I would LOVE to read her new book! I have read “You’re Already Amazing” and was so blessed. I just know this book would be a blessing to my heart in this season. Thank you for offering the giveaway. This book is just what I need, encouragement that Rom 8:28 is real! I want to read & share this with my coworker also… She too needs to know everything is going to be alright, because God Is in control! Is this giveaway still open?! I so want a copy of this book! It sounds fantastic! !